So, Monday was a TERRIBLE night to dine out in Brighton as the city's leading restaurant community left their kitchens to gather for the results of the Brighton Best Restaurant Awards. There are now a handful of local food awards which are public voted, but here they are voted for by local experts; critics, writers, restauranteurs*, chefs and bloggers. I suppose this in some ways gives a better reflection of the top level of dining on Brighton, with voters having greater exposure to the latest and greatest of restaurant happenings. Also in the crowd were the ones to watch for 2017. 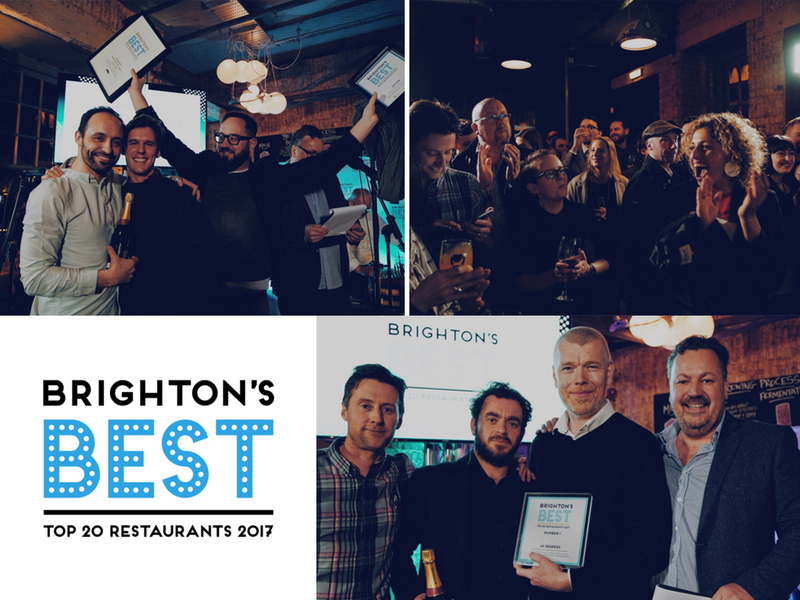 I had a chin wag with both Steven Edwards (Etch) and Matt Gillan (Pike & Pine) about their upcoming openings - it's certainly an exciting year for Brighton food and I'm sure we'll be seeing them on the award boards next year. Also the lovely Aaron Dalton of Smoking Goat fame - fingers crossed he makes a permanent culinary home down here too. I recently dined at his FOUR Sharing pop up and suggest you do too - next one is on the 3rd March. The awards were set up by Brightonian food writers Andy Lynes, Patrick McGuigan and Euan MacDonald with Euan hosting in his, well, unique approach to these things. Award ceremonies can often be a little dry and monotonous but the delivery was hilarious throughout the evening with many casualties of the sarcasm and good natured jest. Even I didn't escape the eye-watering slideshow - thanks for my "mildly terrifying" character appraisal chaps, trés accurate as always. Probably no great shock, 64 Degrees remains the worthy poster boy for exceptional dining in Brighton. Owner and Chef, Michael Bremner also won the award for ‘Best Chef’ and there are exciting plans afoot for their next project. I can't wait. This is the place where chefs go to on their day off and there was huge celebration for its position (up a mighty 11 places from last year). This is probably the best value restaurant in Brighton, yet the food is consistently good. I absolutely love it. Got to love The Chilli Pickle - a Brighton institution now. There was almost a protest organised for their pork knuckle to stay on the menu following it's success in the OctoberBEST festival (which is also organised by Brighton Best Restaurant Awards). Probably my favourite restaurant in Brighton and the only one with three AA Rosettes to its name. Chef and owner Duncan Ray is a true talent who diligently works away at crafting some of the best dishes in the city. Forever pushing the boundaries and running multiple projects, The Set are worthy winners here. They also took away the Best Roast award for the Dizzy Gull at The Brighton Beer Dispensary. I was so proud of my fellow Italians Cin Cin who after only recently opening came straight in at number 6. Finally I can recommend some Italian food in the city! Owner David Toscano was also rewarded for his hospitality with the ‘Best Welcome’ award too. Forza Italia! Another of my favourite spots for their delicious small plates and effortlessly stylish vibe, Plateau remain a reliable dining destination as well as one of the best places for cocktails. Reservations are going to be tight following the enthusiastic review from Jay Rayner recently. Its certainly high on my list to visit next. Silo is a real asset to the city. They offer something different with their sustainable, zero waste approach and elegant, unique plates of food. Proving there are diamonds in the rough on London Road, Semolina is a well loved neighbourhood restaurant, and superb value too. You couldn't have a food awards without the Gingers being mentioned and here they are with their original site, still making an impact. The well loved Brighton vegetarian restaurant in the top 20 and one of the best places for dessert in Brighton in my opinion. Terre á Terre, placed 12th in the rankings. I think the Curry Leaf Cafe are going to have a big year. They have a new site in Kemptown and consistently delight with their fresh, vibrant Indian food. Personally I think Isaac At should have been placed much higher up. The team are unbelievably young but defy their youth with skills and talent in spades. My last meal there was one of the best in recent memory - unmissable. Another of the Ginger group, the more laid back Ginger Pig secures its place with their consistent quality and celebration of Sussex produce. A couple of years ago any pizzeria in Brighton winning any award would have been laughable in my book but Fatto a Mano have brought authentic Neapolitan pizza to our door, finally! Another reason to cross the Hove border, The Urchin pub seems to be going from strength to strength with its shellfish and fish dishes. The Coal Shed is the sister restaurant of The Salt Rooms and offers a slightly more relaxed vibe but with solid cooking and one of my favourite places for steaks in the city. Ever so stylish and a very romantic place to be wined and dined, Riddle & Finns is a great choice for fish and seafood in Brighton. I have been hearing some really great things about Fourth & Church and clearly another I have to visit soon. The wine selection certainly a strong USP. For more about the awards and winners visit brightonsbestrestaurants.com. Listen to Andy, Euan and Pat talk about restaurants on their podcast restauRANT. Click here to listen. *Voters could not vote for a restaurant they own, invest in or work at.